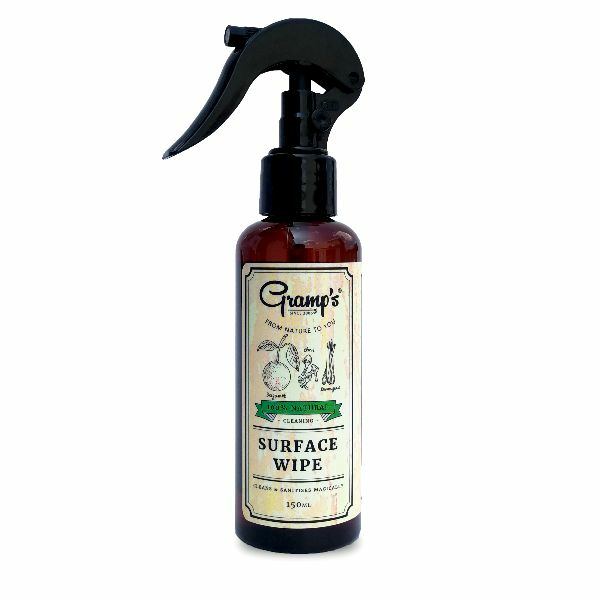 Gramp’s Surface Wipe is an amazing surface sanitizer that acts like a oil and dirt magnet when you clean with it using a cloth. It functions to clean any hard surface such as wood, glass, steel etc with effective ease. At the same time, the formulation contains ingredients that dispel flies from landing on the surfaces cleaned with the solution. Use the surface wipe on tables to sanitize it as it has the ability to remove surface germs and bacteria making it safe for you and your younger ones. Alternatively, it is also effective to clean the cooking area (that does not have heavy and thick grease) that is lightly oily after every cooking session to get a quick but effective cleaning session. Other uses include cleaning your electrical gadgets (avoid water-sensitive areas) that are constantly handled such as laptops, keyboards or handphones. May cause irritation to the eyes. Avoid direct contact. If there is irritation, wash eyes with water. If symptoms persist, seek medical attention. Inhalation of mist or vapors will not harm humans or animals. If consumed or ingested in small quantities there is no harm. However, if a large doses (150ml and above) is ingested, it may cause stomach discomfort. If symptoms persists, medical attention is required. Before transferring the Surface Wipe into another bottle, shake the contents first before pouring. Do not stack up the bottles. Do not store in an area exposed to direct sunlight. Keep the containers sealed properly and store in a ventilated area at room temperature. Shake every time before use. Just spray onto any hard surface and wipe.